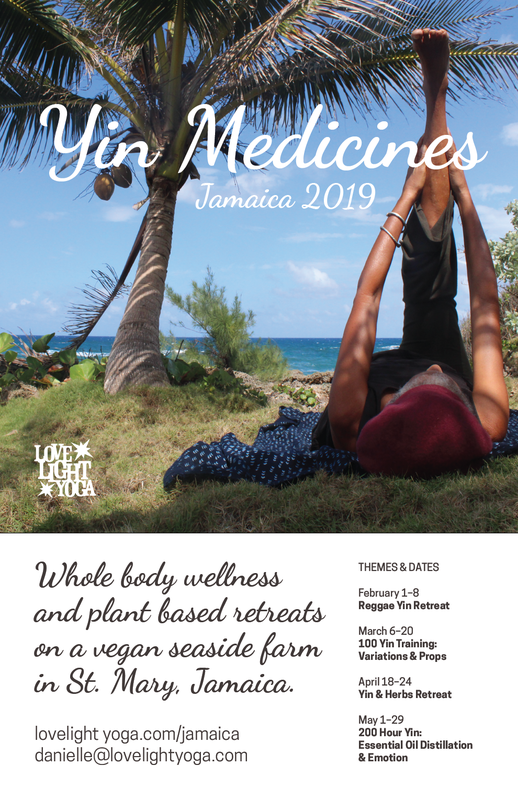 Really looking forward to this special 2019 offering of the Yin Medicines series in Jamaica. We will again be at the farm in St Mary, with fresh spring water flowing for drinking and our outdoor showers, hand built houses, breads made in the cob oven, organic foods, herbal teas and lots of fruit, essential oil distillations, natural adventures, hikes, swimming and unique cultural moments, with lots of yin yoga. This wholistic healing offerings can be for personal growth and health or as education and training. Come and catch a vibe on this modern Rasta family farm for either a 7 day retreat, a 14 day Yin Training or dive right YIN for 30 day Yin Yoga Teacher Training. LLY is a Yoga Alliance registered school and Danielle is an E-RYT, so hours can as CEU or training hours. Accommodations are shared, the meals are vegan and we are in a rural community with limited access. The farm requires you to be able to walk up and down the small hill (a few times a day), but we are also located right on the sea…so you can cool down with a salt dip or a spring water shower! LLY has been running events for 8 years in Jamaican and stoked be running our 4th year in St Mary. We LOVE small towns in Jamaica for the family vibe, untouched nature and true friends. See our retreat and training dates below. If you are hoping to book a private retreat or small group at other times, you can connect with at danielle@lovelightyoga.com. Join us for this special sound inspired retreat during Reggae Month. We will have reggae yin classes with live music by Jason Lee Worton, Jamaican musician and yogi. Attend the Bob Marley Birthday bash in Kingston for an impactful musical history lesson and have an urban moment in one of the world's most creative cities. Come fill up on yin vibes, culture and an education of reggae lifestyle and philosophy. Cost of this trip is $2250USD and includes shared accommodations, all our vegan meals, airport pick up and drop off as well the cost of day trips. Payment is via PayPal and a $500USD deposit holds your space. Final Payment January 1st. Application here. This offering is for teachers and students who are looking for an in-depth exploration of yin shapes, their variations and the utilization of props as we explore the power of the skeletal variations and cultivating the confidence to creatively adapt our shapes. This asana lab counts as Yoga Alliance CEU and includes lots of personal practice and creative education. Cost of this trip is $3500USD includes shared accommodations, all our vegan meals, airport pick up and drop off as well the cost of day trips and a printed copy of the yin manual. Payment is via PayPal and a $1000USD deposit holds your space. Final Payment February 6. Application here. Come for this retreat filled with herbal teas, tinctures and steaming for personal healing. Learn about local medicinal plants, create personalized heath products and visit with local herbalists and expand the potency of yin yoga. This course counts towards Yoga Alliance CEU and involves pre reading. Cost of this trip is $2250USD and includes shared accommodations, all our vegan meals, airport pick up and drop off as well the cost of day trips. Payment is via PayPal and a $500USD deposit holds your space. Final Payment due March 18th. Application here. This Yin Yoga and Oils Teacher Training can be experienced as both a full personal immersion and a professional unit. We will learn basic distillation set up and aromatherapy principles and how they enhance yin yoga for improved emotional health. We will uncover themes of adaptivity by implementing simple changes, through essential oils and meridian work, that will impact our emotional wellness. This training includes extensive practice teaching within the local community, hands on plant education, and a diverse application of yin yoga. Cost of this trip is $6500USD and includes the full training and manual shared accommodations, all our vegan meals, airport pick up and drop off as well the cost of day trips. Payment is via PayPal and a $1500USD deposit holds your space. Final Payment is due April 1. Application here. Yoga Alliance CEU or as fully certified 200 hour Yoga Teacher. Past Events & Retreats. Good times. True Self Pop Up Class and Shop. LLY Pop Up Shop in Vancouver. Sound Salutations: Reggae Yin in Vancouver.